What a dismal, dispiriting day here in Scotland’s capital city. All I can hear is the constant sloppy smack of raindrops dripping from our oak tree onto our conservatory roof. Other than a paid-for ticket to somewhere equatorial the only thing for it is a big colourful bowl of soup. The brighter the better. My good friend Niki at unifiedspace specialises in colour, especially as it relates to interiors (she used to design paint colours). Recently, on a dank dreary day like today, she sent me some lovely photos of a halved butternut squash. As I looked at this humble, exceedingly useful vegetable* I realised that its hypnotically vibrant hue was not only very pleasing to my eye but that it was having a psychological effect on me too. I quickly felt more energised and motivated. It perhaps sounds a bit hokey, and the sceptic in me dismissed this effect as coincidence, but it happened again while making this soup. Not quite the effects of caffeine – I don’t think we’ll all be rushing out to get a butternut squash juice Americano any time soon – but I definitely felt a boost. I can’t promise that you will experience a similar benefit, but what I will guarantee is that if you make this soup, its deep saffron colour will make you smile. I think it has banished thoughts of warm foreign climes – for now. The science bit*: Technically butternut squash (Cucurbita moschata) are fruits, filled as they are with seeds, but culinarily they are vegetables. Although we tend to peel and discard the skin, all parts of this magnificent vegetable are edible: the roasted seeds are particularly delicious and a valuable source of zinc, Vitamin E, calcium, iron, protein and fatty acids. The flesh itself is a rich source of beta and alpha carotene (which give them their orange colour), vitamins C and E, potassium and fibre. Like sweet potatoes, butternut squash are a medium glycemic load food, so won’t have a significant effect on blood sugar levels when eaten in moderation; combine with a protein and lower the impact even more. What else? : Butternut squash makes more than just a creamy, pretty soup. Steamed, raw-grated, roasted or boiled it can easily sweeten and fibre-up a cake or bread, add interest to most stews, pair up with soft cheese, roasted garlic and herbs for a great dip and, until the delicate spring vegetables arrive, lend colour and a sweet note to risottos and grain-based salads. Chop, blanch and freeze any leftover raw butternut squash for later use. It is virtually interchangeable with sweet potato but keeps a bit better. Preheat the oven to 180C/350F. Brush oil onto a baking sheet and place the squash halves cut-side down on the sheet. Bake until the squash is starting to blacken and blister – about 45 minutes. Remove the squash from the oven and allow to cool before scooping out the cooked amber flesh. Roughly chop then set aside. Heat the oil in a large saucepan over a medium-low heat. Add the onions or leek and sauté – covered – for 3 minutes before adding the garlic, apples, ginger and garlic. Recover the pot and cook for a further 10 minutes, until everything is softened. Add the squash and vegetable stock and bring to the boil. Reduce the heat to simmer for 10 minutes. Remove the cinnamon stick (if using) before blending with a stick/hand blender, or working in batches, use a food processor or blender. Taste the soup and adjust the seasoning with salt and pepper, if desired. Serves 4. 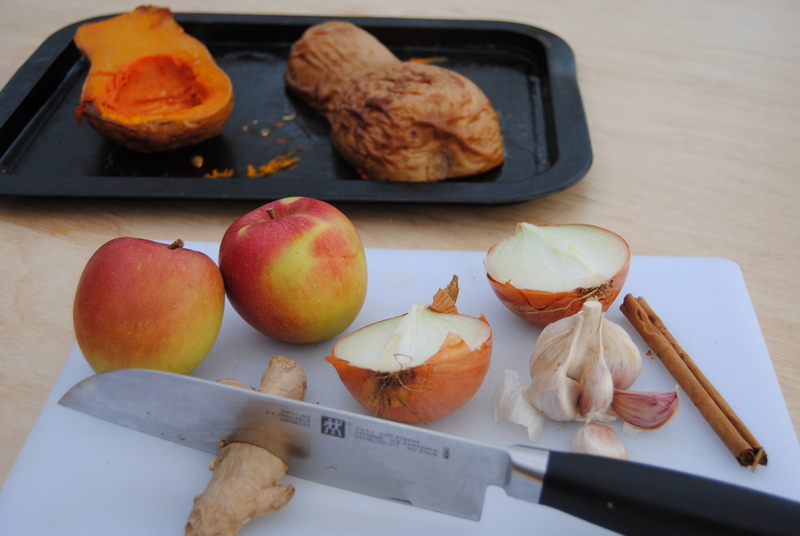 Quick method: Cube peeled raw butternut squash or sweet potatoes. Add the cubes to the pot after the onion and garlic have softened, pour over the stock and fast-simmer for 20-25 minutes. The soup won’t have as rich a taste as the roasted version but it saves a few calories and it still tastes really good. UPDATE: This is the way I now make this soup – super easy! (November 2013). Toasted seed garnish: Use the seeds scooped out of the butternut squash halves to make a gorgeously crunchy garnish or salad topping. To be honest, they usually don’t make it to garnish stage as I tend to hoover them straight off the baking tray, save for a couple of tablespoons worth. What you do: Separate the seeds by pinching them with your fingers, rinse them in water and pat dry on some kitchen paper. Rub any remaining stringy orange bits off of the seeds and put the seeds into a small bowl. Pour over 1/2 tsp of a neutral oil, like rapeseed/canola, and sprinkle over a flavoured salt blend of your choice, or perhaps some garlic salt/powder or smoked paprika: mix all together with your fingers. You can skip the added oil bit but I think it helps crisp the seeds up. Pop these onto a baking tray and bake at 150C/300F for about 12-15 minutes, or until a few pop. Allow to cool before storing in an airtight container. We like these seeds much better than commercially produced pumpkin seeds. I didn’t know that butternut squash seeds were a good source of zinc and I read only yesterday about some new research that found by taking extra zinc at the very first signs of a common cold you can alleviate the symptoms. Healthy and delicious, fantastic! Glad my nerdy musings were useful! Toasted b’nut squash seeds are one of my favourite snacks – and they are free. The zinc hit is a bonus. If you make the soup, let me know of any tweaks you make. You are so inventive with recipes and take such gorgeous photos, too. Glad you are making it your own. Do try it with the cinnamon, just for comparison. I think you are now my official taster. Must make up some sort of badge for you and send it over. If this cookbook ever sees the light of day you will in my credits! Just finished off my first batch of your soup, wow it was lovely. I think l will try it next time with a wee but more ginger to clear the cobwebs away. Thanks for the recipe. You’re very welcome, Gemma. I love it quite gingery too, but I put a smaller amount in the recipe so as not to scare anyone. Let me know if you try anything else. Made this for a group of friends and all thought it very tasty. The comments sounded like a wine tasting once they knew the ingredients – ‘hint of apple coming through with subtle overtones of ginger’. Cinnamon is a must! Thanks Catherine! Anyone who has tried it without the cinnamon doesn’t know what they are missing. Chucking it down here. How’s London? Great soup, and I love the color of butternut squash too! I also love the bowl you’ve got the soup in :-). Although it’s not soup weather today in California, we had a spell of stormy weather last week which would have been perfect for this soup. Can’t wait to try it out! I got the bowl from anthropologie (they know my name there. How bad is that?!). Our weather is decidedly autumnal but I’m heading over to Florida to see my family so I think this is the last batch for a while. Back to salads and shorts! Awful picture but glad you like the sound of the soup Elaine. 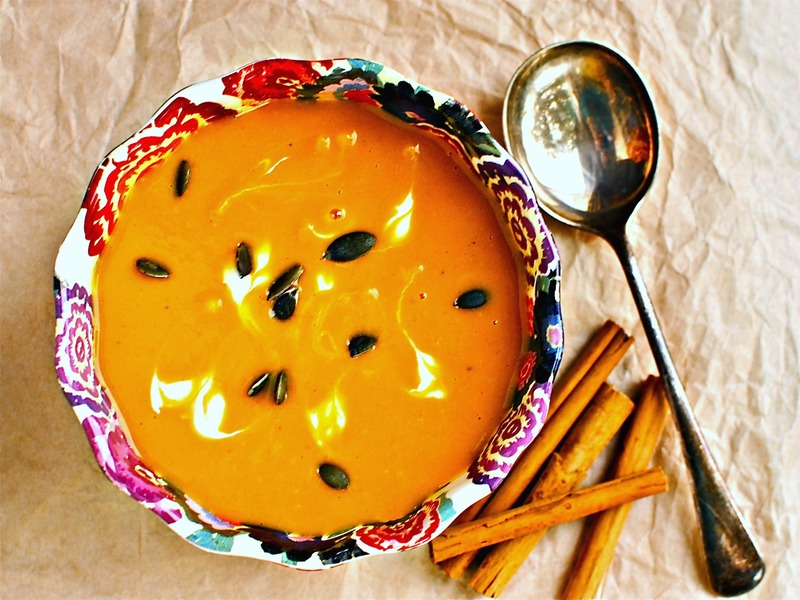 Welcome to squash love this soup looks delicious!